Plaster of Paris Crafts are Easy and Inexpensive. A tub will go a long way! 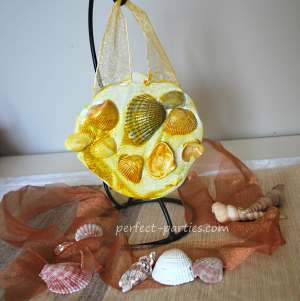 Make wall hangings, displays, pins, magnets, paper weights, and more. Here is a list of crafts on this page. Scroll down to see them all or use these links to quickly jump to it. Shells, figurines, pebbles, erasers, rocks, etc. Ribbon if it's to be hung. Write name on back of plates and cut a piece of ribbon if you want this to hang this project. Place ribbon on plate where you want it to be. Have items ready to put in place. Pour the plaster onto paper plate on top of the ribbon. 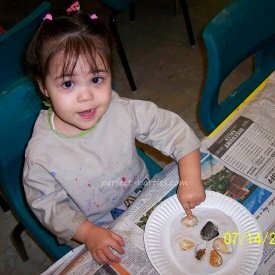 Gently press pebbles, rocks, shells, figurines into poured mixture. Paint and let dry. Send home on plate. You can put tissue around it or in a ziplock to protect. You can have parents peel plate off later. 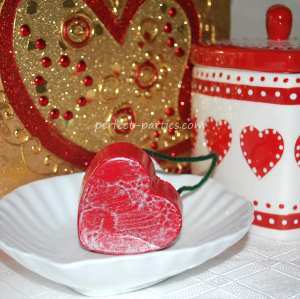 We used the Wilton Silicone Heart Mold to create this ornament but you can use other types of molds. You can make ornaments, paper weights or just a fun decorative piece to take home. Paint, add stickers, glue on rhinestones to decorate. For this project, make the hearts ahead of time so it has time to dry especially if it is the first time you are making them. Make a couple extra in case a child drops theirs and it cracks or one doesn't come out of the mold perfectly. Experiment with different silicone molds. We've also tried plastic candy molds which work well. Use a disposable mask while mixing product. It is a very fine powder. Keep away from children while making the mixture. Always read the directions completely.